A country of just under 5 million people, New Zealand is home to around 200 ethnic groups — and one in four residents were born overseas. “We’ve made assumptions about what our country is: Clean, green, peaceful, welcoming, safe,” said Zain Ali, an Islamic studies researcher at the University of Auckland. Last month’s attack, said Ali, has caused many to reexamine those assumptions, especially in regard to Islamophobia. As the nation mourns the dead and reforms its gun laws, Muslims, minorities, and migrants are now coming forward to share their experiences of everyday life — forcing many New Zealanders to ask themselves uncomfortable questions, regarding tolerance and openness. Diverse — but how inclusive? 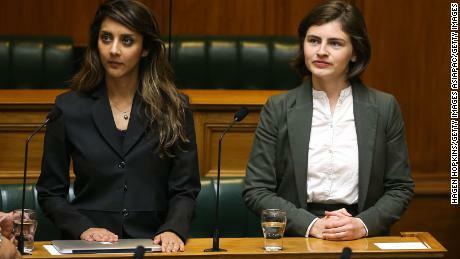 “We’ve always known racism to be a reality in New Zealand,” said Saziah Bashir, a 32-year-old Muslim New Zealander, whose Bangladeshi family migrated to New Zealand from Brunei when she was 11 years old. Growing up, Bashir was often the brunt of racist jokes, especially after 9/11. Later, when Bashir, who works as a lawyer, began publishing personal essays in local online publications in her spare time, she often received hate messages on social media. Things were even harder for her hijab-wearing mother, who Bashir described as “soft around the edges.” Strangers yelled at her from cars or confronted her in the supermarket in Auckland, New Zealand’s biggest city by population, and told her to go back where she came from, according to Bashir. Sometimes, her family didn’t feel comfortable with their 58-year-old mother going out alone. “These ongoing experiences were always what we considered so minor and actually part and parcel of our lived experience. We never wanted to escalate it — and we never wanted to cause trouble,” said Bashir. Anjum Rahman had been telling authorities for years about hate speech directed against Muslims. “We were just starting to feel really uneasy,” said Rahman, from the Islamic Women’s Council of New Zealand, who is Muslim and wears a hijab. She believes the police had a “blind spot” about white supremacists and were complacent about the possibility of a serious attack. Others question whether the intelligence services were focusing on the wrong people. New Zealand has launched a Royal Commission of Inquiry into the attack, which will consider what actions state sector agencies could have taken to prevent it. “There’s a broader question (here) about national identity,” he added. Many New Zealanders didn’t understand how much hate speech there was in the country because they weren’t the targets, Spoonley said. When movie director Taika Waititi said last year, for example, that New Zealand was “a racist place,” many of his countrymen countered that it was less racist than neighboring Australia. Spoonley said that was probably true but the response was also a “cop out.” He estimates there are around 500 white extremists in New Zealand, some of whom have committed violent crimes. When Golriz Ghahraman, New Zealand’s first refugee member of parliament, saw the slaughter in Christchurch, it hit home especially hard. Hailing from Iran, as she’d long born the brunt of Islamophobic comments online. People had called her a terrorist, claimed she would introduce Sharia law and questioned her right to criticize the government in New Zealand because she wasn’t born there. She had also noticed threats of gun violence against Muslims in articles on New Zealand websites. “You realize some of them mean it,” she said. While inciting racial disharmony is an offense under the Human Rights Act, there is no provision explicitly covering hate speech in relation to religion, gender, disability or sexual orientation in New Zealand. There are no government bodies to collect data on hate speech or on actual attacks. When Spoonley chaired a group of government departments and non-governmental organizations looking into hate speech late last year, he found that New Zealand has a “permissive” environment towards hate speech, with a large volume of Islamophobic speech on New Zealand websites, by New Zealanders. The government is now fast-tracking a review of its laws, which could see hate speech made a criminal offence. Ghahraman supports a tightening of the rules and said she believes the spread of hate speech and fake news online contributed to the Christchurch attacks. Rahman, of the Islamic Women’s Council, said people online can use multiple identities to create the illusion of widespread support for extremist views, emboldening others who hold such opinions. Since the attacks, Muslims have reported random acts of kindness — strangers coming up to them on the street with hugs and offers to carry their shopping. Ali, the Islamic studies researcher, was also hopeful.